first off, that picture is hilarious. i would say we are a looooooong way from ever having usb host support on our motorola droid devices, but these news blurbs always seem to fly around nicely with the gadget crowd. The system takes advantage of the fact that Motorola used USB-OTG capable hardware when they built the DROID, choosing to pair it with a standard USB Micro-B port rather than the Micro-AB port normally found on an OTG device. 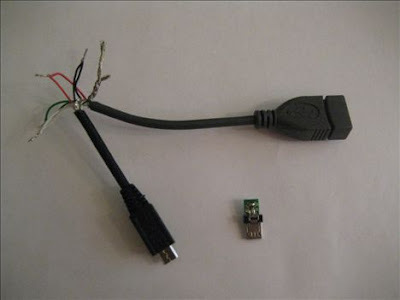 To work around that, you need to create a microUSB to USB connector cable – with some judicious rewiring of a couple of regular cords – together with a tiny adapter that, when inserted into the DROID while it reboots, enables the Host mode. so what does all that mean? that we could at some point connect our droid directly to a printer or USB flash drive and have our device acting more and more like a netbook. unfortunately, there are no drivers to support any of this, so for now we’ll all just have to keep day dreaming. "unroot" your motorola droid before android 2.1 ota update?